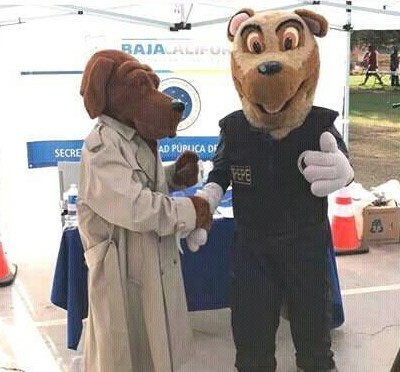 Crime dogs American McGruff and Mexican PEPE meet for first time ever. Visitor Contribution: The names Calexico and Mexicali are both city names taken from the names California and Mexico. This two cities are separated by an International Border fence that once was not visible as it was a small chain link fence. Today that is an ugly wall that only blights both sides of the border. The Imperial and Mexicali Valleys are border communities separated by a border wall, but where people have long ties that date back to the 1900's. The economic partnerships, the family connections and cultural heritage unite both communities. President Donald Trump of the United States proposes to build a big wall along the US/Mexico border, but in Calexico and Mexicali two neighborhoods are united by a cause and challenged by the call of John F. Kennedy's inaugural speech of "ask not what your country can do for you, ask what you can do for your country". Both neighborhood groups have signed the first unique bi-national neighborhood friendship and agreement that will focus on bringing urban art and neighborhood revitalization efforts to both neighborhoods. On Saturday, August 20, a signing ceremony was held in the 13th street of Mexican Neighborhood of Santa Clarita in Mexicali, Baja Californian Mexico. This trans-border agreement was made between two neighborhoods that have a similar history of activism and community involvement that decided to break border barriers to create something unique in favor of its people. The Kennedy Gardens Subdivision in Calexico was established in April 1972 in Calexico, California. A total of 299 homes were pre-fabricated in this subdivision and awarded to unique Mexican immigrants families. The Colonia Santa Clara Neighborhood is located in the city of Mexicali, Baja Califonia, Mexico. Proyecto Calle 13 was established to promote the urban arts along the neighborhood and its beautification. This international partnership of both communities will share a similar history because most US residents in the City of Calexico are immigrants from the neighboring Mexican city or further south. Both neighborhoods will work to create urban art and revitalize the neighborhoods. With the help of the Mexican Consulate Mexicali artists will help improve the North US city that is in need of much repair and improvements. The plan is to also look for artists in California so they can see the opportunities to exhibit and create their art in this area. Proyecto Calle 13 has worked on a mutual project on the fence on the Mexican side and they plan it to rehabilitate the border mural project on the U.S. side as well. This will certainly help to beautify and improve both neighborhoods and cities and help bring a better quality of life to the neighborhoods. 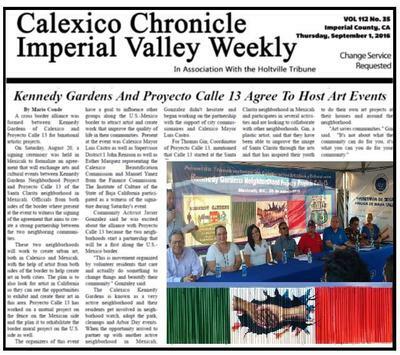 Proyecto Calle 13 started at the Santa Clarita neighborhood in Mexicali and participates in several activities and was looking forward to collaborating with other neighborhoods along the area. The participation of children, youth, and neighbors has been important to reconstruct parts of Santa Clara. 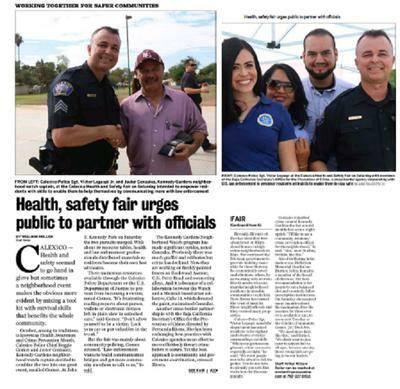 In October 2016 soon after the signing of the agreement, they organized and celebrated National Crime Prevention month on October 29 by holding a Heath and Safety fair. 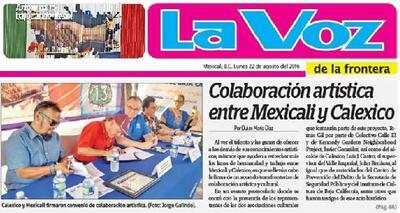 Neighbors, community leaders, business members and government officials from both countries participated in the event. This was Kennedy Gardens Neighborhood Watch's first celebration of crime prevention month since becoming an official Neighborhood Watch group in 1995. Baja California State Director of Crime Prevention was the guest speaker at the event. And in preparation for the fair, several murals and improvements were made by volunteers from both countries. The event took place at the John F. Kennedy Park in Calexico California. At this fair, both the American and Mexican crime dogs McGruff and Mexican PEPE met for the first time ever. The Calexico Police Department stated that the US. Justice Department Office of Community Policing requested a copy of both dogs meeting for the first time. Editors Comment: Thanks for sharing that inspiring story. The need for neighborhood revitalization truly knows no boundaries. Let's hope that other border communities can learn from this.